The riggish scent of the sea hangs strongly in the air; there’s a chill wind and I feel uncomfortable as a strange and creepy feeling envelopes the beach strewn with storm detritus and mounds of kelp. In the distance lies “The Log” a casualty from some long ago episode when it washed ashore to lie abandoned and forlorn. This is a hostile place for ships when the Cape is battered by the huge breaking Atlantic swells. Just off this beach lie four shipwrecks and some say that the ghost ship “The Flying Dutchman” still plies these waters…..
“Wandering with my camera, I often find my eye drawn to strange bedfellows. Juxtapositions. Foils, unexpected pairings ….” so says Michelle at WordPress in her challenge for the week as she sets the topic “Juxtaposition” for this week’s challenge. Here, over our summer season, the beach scene generally hums and you never quite know who’ll be there strutting their stuff. 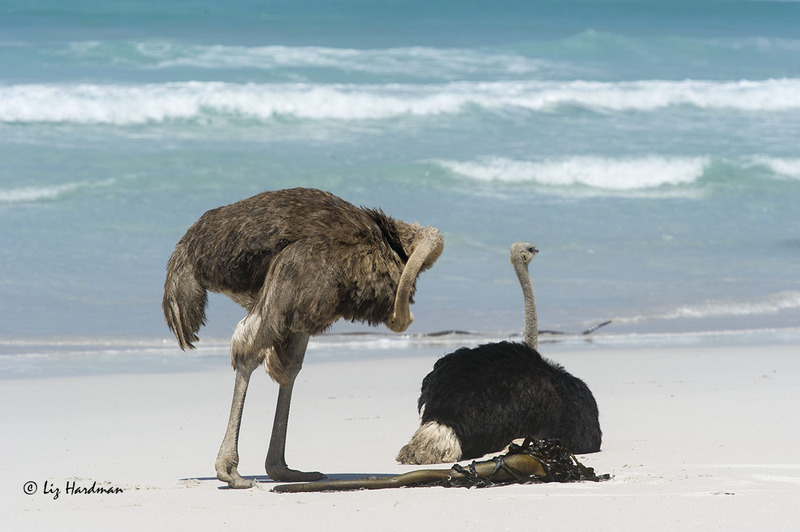 So it looks as though feathers are in this year for the latest in beach attire…. Just checking the fluffy bits. 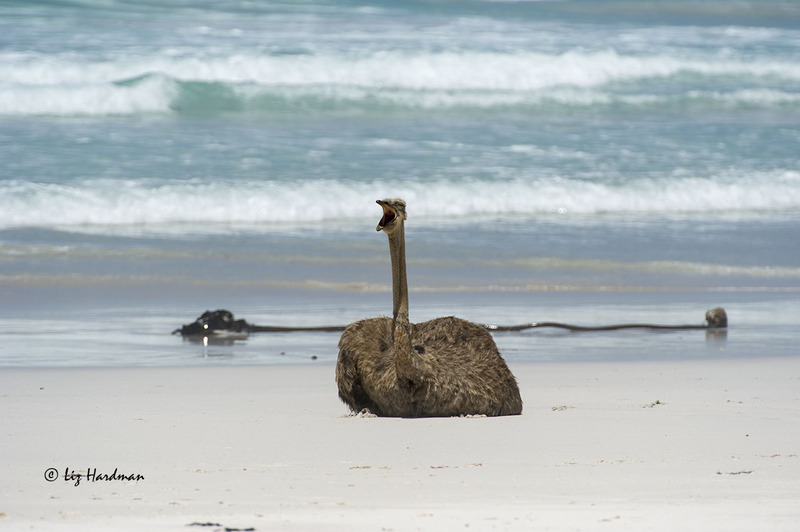 Ma and Pa ostrich checking out the beachgoers. Ma’s quite unfazed by all the attention. All part of the day’s outing – swimming, sunbathing, cooling off at the water’s edge. Where food is concerned the Cape Peninsula’s Chacma baboons keep a strict pecking order and usually males dominate, with the alpha male reserving top status. With the recent spate by the authorities to cull off aggressive male baboons an interesting development appears to be taking place. Female baboons are now honing assertive raiding skills. Here a monitor escourts a couple along the beach wit their picnic fare after the two baboons have raided picnickers further along the beach. This female has been successful in snatching a food item. Here the female licks the last of the tastes off the food packaging. Female watches intently before rushing at couple walking along the beach path with their picnic. A female baboon pestering a picnicker, jumping up for the food. Eventually the man threw out a ‘decoy’ offering. Female making her way to the carpark. Finds a car with unsuspecting visitors and leaps in. Scores the remnants of a packet of biscuits. A good vantage point, watching for people to open car doors. Checking out the biscuits, with the kestrel in the background. 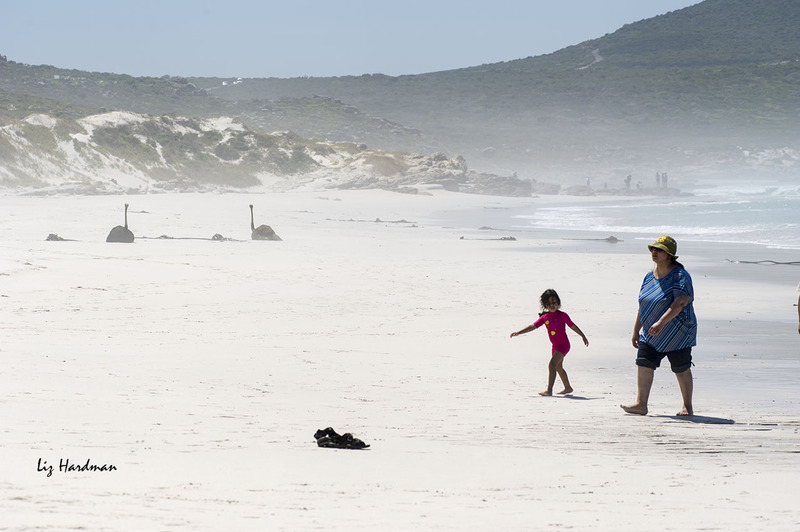 On Boxing Day tens of thousands of people head to the beaches around the Cape Peninsula and this year it was a hot, sizzling kind of day. Colourful scenes were cast, revelers enjoying the day. A day to chill, complete with barbeques, picnic fare, families in a day out with all their beach paraphernalia. 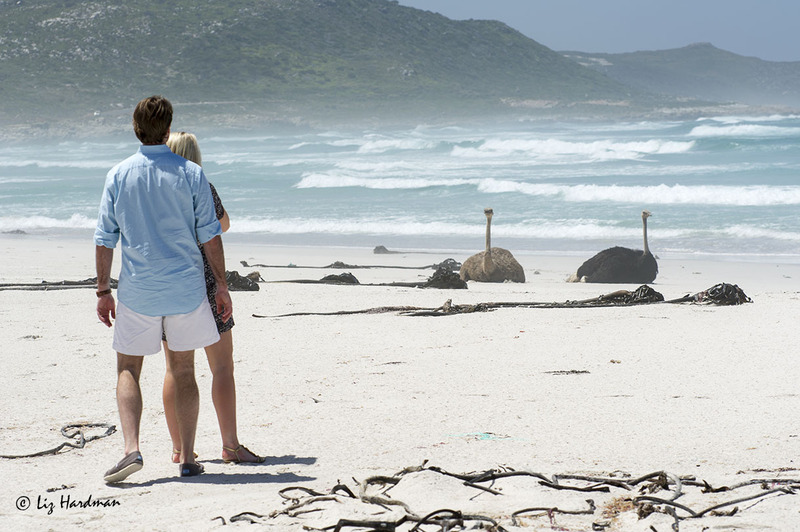 Many of the Peninsula’s fine white sand beaches are kept “pristine” by the regular removal of kelp and other detritus. But some are left to nature’s cycles, and in this case local knowledge is an advantage, spelling the difference between comfort and discomfort. In August i wrote about the anatomy of a working beach, the complex symbiosis of sea wrack and the legions of ‘detritus movers and shakers’. Here is the summer guise of the same beach, still very much the domain of bird and buck, sand hoppers and sea lice. What’s a gal to do when the mercury is rising and her feather’s equate to a winter’s weight duvet? Feathers awry – stretch to catch a little breeze? The heat of the day catches, mirages form shimmering on the horizon. Even the buck are caught in a state of ennui. A swishing tail flicks away the bothersome flies. The young bachelors hang near the dried-out stream bed. Swift terns line the rocks, feathers’ slightly ruffled in a soft sea breeze. The rotting dried out corpses of Slender Sunfish lie on the beach; victim of the southeasterly winds and the upwelling of the chill Benguela current. An intrepid party of beach goers arrive; foreigners – French speaking. As they set up in the midst of sand hopper terrain, not far from the high methane scent of rotting kelp, i can’t help but wonder how long they’ll last before moving to a more hospitable venue.